Good morning! I am amazed and saddened to share today. After years (ok, a few decades-but that makes me sound old!) of budgeting and keeping a price list, I wondered if I had become too relaxed. So for the whole month of February, I wrote down everything we spent, even the $2 gas station pop. I was amazed at what I discovered! I would recommend that everyone, even if you have a budget and are reducing debt, try tracking all of your spending for a month! We’ve always had a budget, mainly so I could have a checklist of monthly bills. When we were first starting out, I didn’t want to forget to pay any of the bills. 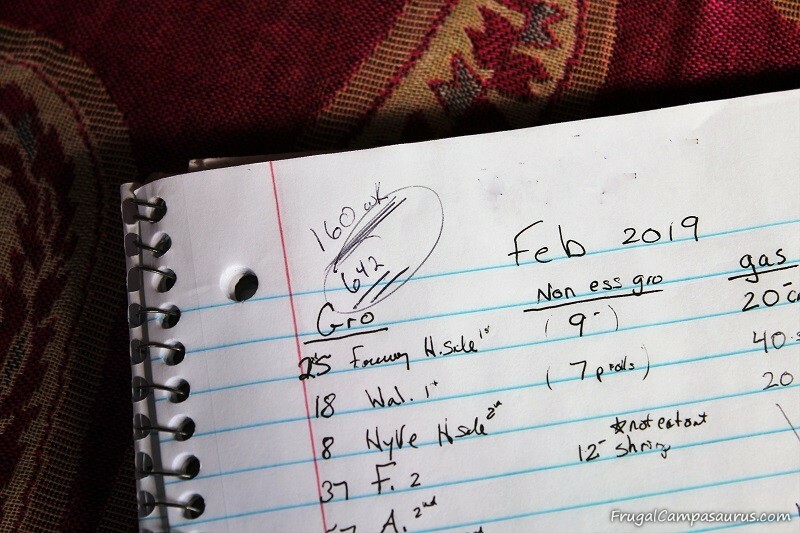 Our budget was like using a month-long list, and I love lists. In February, I made 2 more lists. I wrote everything we spent in a small notebook that I kept in my purse. Then when I had time, I transferred all the amounts to a regular notebook with columns for different sections. I had vehicle gas, restaurants, other (truck anti-freeze) and grocery sections. Next to the grocery section, was a nonessential grocery section for items like cookies or chocolate that accidentally found their way into my cart. I have a few debts I want to pay off this year, so I wanted to make sure I wasn’t frittering away our money. Mostly, I thought I had the vehicle gas budget wrong, and I wanted to use some of it for debt reduction. Boy was I wrong! The vehicle gas budget was fine. I had budgeted what we use and was not writing extra checks for gas during the month. The restaurant budget was even good! Usually, not eating out is a huge problem. But in February, we had a one day trip planned which included eating Valentine’s Day lunch out. The trip and meal were in the budget and saved for, even the BBQ take-out to take home for the kids. The rest of the month, we were good and ate mostly at home. 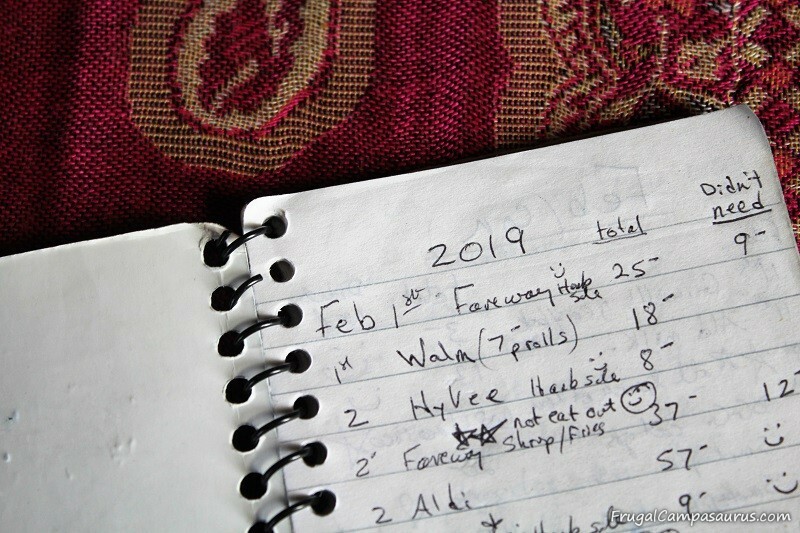 To encourage us to eat at home, I would write down (in both notebooks) the date we went home to eat instead of eating out. Then I drew large stars around the words ‘NO Restaurant!’ next to the date. It made the restaurant section look long- but very happy! Unfortunately, the grocery budget section was horrid! I budget either $75 or $100 per week for groceries for our family of 4. This amount has been fine for a long time. It worked when our budget was tighter, but as our debts are getting paid off-I wondered if I was getting more relaxed with spending. After February, I know I am way too relaxed with the grocery budget! We actually spent $642 on groceries for the month- $160 a week! That is about double what I budget for groceries! I decided to look up average family food costs in the U.S. The difference between my budgeted amount and the listed amount was shocking! Every month, the USDA lists the average food costs for a nutritious diet cooked at home. There are categories for different family sizes and different aged children at 4 different spending levels. Over the years, I have seen the USDA average food cost amounts on other blogs. But I know many people manage a lower food budget by cooking from scratch and by shopping sales. At the end of February, I put all our purchases into categories- the grocery one was amazing, unfortunately! I do shop the sales and buy extra groceries when the prices are very low. I am also trying to cook at home more, but I couldn’t believe how much I actually spent. It was over my budget amount and even over the thrifty plan amount. Shopping sales and stockpiles are great ways to reduce costs, but for me they are actually part of the problem. I over buy when I see a good sale, then it is hard to use the groceries all up before the next good sale. I take extra money (that could actually be used for debt reduction!) to use on sales. Recently, the husband helped me organize the cupboards. Unfortunately, when peanut butter went on sale, he remembered I already had 10 jars of peanut butter left from the last good peanut butter sale. At least this helped me not to buy any more peanut butter, though I really wanted to! 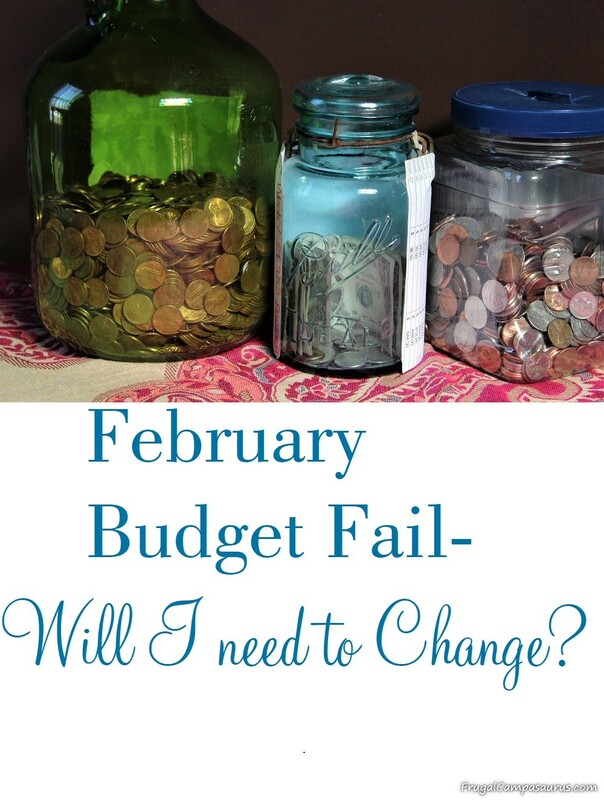 Since my February Budget Fail, I have decided to try 3 ways to fix the grocery spending. I am going to increase the budget slightly to $100 for every paycheck. This may be more realistic with prices, and hopefully I will quit using extra money that could go to debt reduction. I am also going to plan and cook at home more. I really need to use the sale items and food stockpile we have, so it isn’t wasted. Then, I can watch for more sales! My last way to fix the grocery budget is my favorite! I am going to make it a challenge! When I stick with the budgeted amount for the week, and don’t use extra money from other areas, then the money left in the grocery envelope will go to our smallest debt. If I can find $50 extra a month, it will be paid off 6 months early! Woo-whoo! I was so excited last week to stay within the grocery budget! $14 extra went to our smallest debt! I had $14 extra in the grocery envelope, not much- but better than using $30 extra for a sale on chicken. Of course, it helped that there were really not any good sales last week. I’m so glad that I tracked all of our spending in February! Even though I was wrong and the vehicle gas budget was fine, I am glad I found an area that does need work. I know it is recommended to track spending, so you can see where your money is really being spent. But since I have budgeted for many years, I never thought I needed to. Tracking everything also seemed like a huge hassle, but the 2 notebooks made it easy. When shopping, I could quickly write spending amounts in the small notebook. Later, I separated it into sections in the regular notebook. At the end of the month, I was amazed at the actual amounts in the different sections! Thanks to our February Budget Fail, I now have a budget area (grocery spending) to work on. Hopefully soon, I will also have extra money to pay off our smallest debt early! Try tracking your spending and see if you have any similar, amazing discoveries! Previous Post:Walking Sticks: Great Souvenirs or More Practical Options?